Our exclusive business apartment with loft character for up to 8 people. 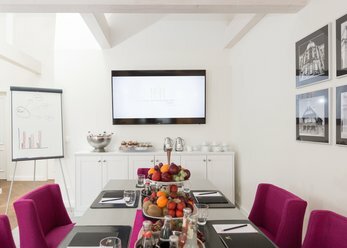 These variably usable rooms offer you the possibility in a stylish ambience to hold meetings, conferences or team events. It's an old barn (former cowshed) which was rebuilt as a party barn with bar. 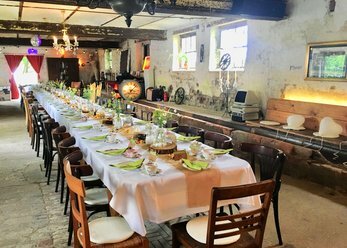 The party barn is about 300 square meters. The other barn with imposanterm roof (height 15 m) is located right next to it and can be used to stay. With old U.S. school bus. You are looking for a special and appropriate motif for your filming or photo shoot? 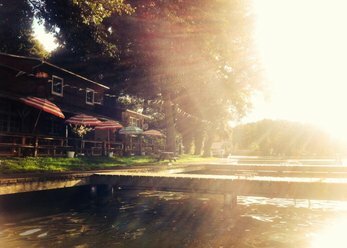 The island is located in the middle of a lake in Brandenburg, Germany. It is a beautiful island and can be reached only by ferry or ship. Castle with a chapel, Gewölbek. 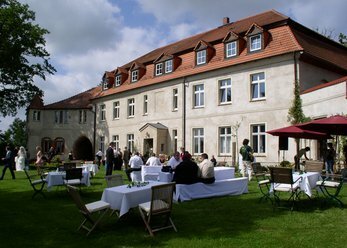 Castle and Guest House are located in the Northern Brandenburg - halfway between Berlin and Hamburg. Can be used for weddings, family celebrations and corporate events.